The «fossil» which Schoeps, emeritus professor of German at the University of Illinois at Urbana-Champaign, has examined is remarkably rich and multilayered. Indeed, as its title indicates, the study does not only encompass Nazi literature and film, but also non-Nazi and anti-Nazi literature written either in liberty or in concentration camps, prisons and ghettos (p. 226-289). The book also includes rather discreet but nonetheless interesting pages on Nazi histories of literature (p. 46-56), Germanistik in the Third Reich (p. 56-59) and classicism and romanticism in the Third Reich (p. 59-61). Every palaeontologist knows that understanding fossils requires a thorough work of decipherment. The body of texts analysed by Schoeps, whether pro-, non- or anti-Nazi, were written in coded languages. It is all the more so in non- and anti-Nazi works. As opposed to the authors of the Outer Emigration (e.g. Thomas Mann, Bertolt Brecht, Lion Feuchtwanger) those of the Inner Emigration  and resistance movements within the Third Reich had to use a carefully coded language to escape the ferocious Nazi censors. Indeed, this coded language was sometimes so cautious that it led to curious misunderstandings. Werner Bergengruen’s 1935 novel Der Groβtyrann und das Gericht (The Great Tyrant and the Court) was read by the Nazis as a Führer novel while the non-Nazis appreciated it as a resistance novel. Bergengruen’s case demonstrates «how two-edged the sword of the slave language was» (p. 231). On the other side of the spectrum, one may cite Ernst Jünger whose emblematic work, Auf den Marmorklippen (On the Marble Cliffs), was considered to be «a resistance novel, but at the same time, it fit into the fascist aesthetics of violence» (p. 4). Schoeps’ discussion of all these nuances is simply masterly. The book is made accessible for unspecialised readers with the inclusion of two brief chapters explaining the ideological and historical context in which all these literary works and films, whether pro-, non- or anti-Nazi, were produced (p. 9-34). Another chapter is dedicated to literature and cultural policies in the Third Reich (p. 34-68). These three chapters will definitely help all readers who have slight or no knowledge at all of the Nazi era and of its now archaic glossary orient themselves. Although this new English-language edition has been revised and expanded, Schoeps admits that the book is not complete yet and informs his readers that chapters on theatre in the concentration camps and on the activities of the Jüdischer Kulturbund (Jewish Cultural Association) had to be left for another edition (p. 2). Given the quality of the present edition, one can only hope that these chapters will be included in the next one. Schoeps’ book is the first complete survey of literature in the Third Reich in the English language. Based largely on German-language archives and scholarly books, Literature and Film in the Third Reich introduces the English-speaking readers to a world which would have otherwise remained inaccessible to them. The only criticism which one may raise would be the disproportionate focus on literature (199 p.) to the detriment of film (22 p.). Der Filmminister Goebbels did certainly not merit such negligence inasmuch as the seventh art was the privileged propaganda medium of the «State [Ministry] for the Dissemination of Truth and Optimism»  . The pseudo-title of « the State Minister for the Dissemination of Truth and Optimism », referring to the almighty Reich Minister for Public Enlightenment and Propaganda, was coined by Werner Krauss (not to be confused with the actor of the same name), a specialist in romance languages and literatures, in his anti-Nazi resistance novel PLN: Die Passionen der halykonischen Seele (ZIP Code: The Passions of the Halyconian Soul) which he had written in 1943-1944 in his cell in Berlin-Plötzensee prison (p. 263). The action takes place in the seventh year of a world war waged by the fictional Great Halyconian Empire where every citizen «has the unrestricted right to remove oxygen from the air, day and night, free of charge» (p. 263). Krauss’ novel which had to be smuggled out of his cell in the shape of «pieces of paper written quickly in cramped writing» (p. 262) makes the Nazis and their regime a laughingstock with wit and grace. Arguably, the chapter eight on «Non-National Socialist and Anti-National Socialist Literature» is the most refreshing. Among others, the reader will certainly find the distress of Oskar Loerke, the secretary of the Literature Section of the Prussian Academy of the Arts expelled by the Nazis in 1933, deeply moving (p. 249-252) and the defiant black humour of Werner Krauss most delightful (p. 261-267). On the other hand, it would be wrong to think of the authors of the Inner Emigration and resistance as fighters for democracy. While the inner émigrés embraced a passive and conservative attitude towards the Nazis, the authors of resistance were mostly Communist, e.g. the members of the Rote Kapelle (The Red Orchestra), the pro-Soviet resistance organisation, hence by definition more combative. Still, none of them was held in great esteem by Thomas Mann who claimed that all the books published in Germany between 1933 and 1945 would always have an “air of blood and ignominy” about them (p. 280-281, fn.1). The chapter eight of Shoeps’ book proves the opposite. And as Ernst Wiechert, one of the authors of the Inner Emigration, wrote in his post-war memoirs, those who fled Germany after 1933 could never put themselves in the inner émigrés’ shoes: «I understand that it is hard for the victors to imagine the life of the outcasts in those years and to make a fair judgment. Erika Mann said in a disparaging manner in the New York Herald Tribune that after my release from the camp I had become an ‘obedient boy’. But I do not know whether Erika Mann, if she had just been released from a German camp, would not have become an ‘obedient girl’. And if she knows anything about what it is like to have listened every night long for seven years to every car that drove down the street, and to reach for the pistol to see if it is cocked. I do not know if she learned that in Switzerland or in California, and I would not wish that on her, either. I only wish that she would realize that the life in the column of the newspaper is very different from what we led every night for seven years» (p. 227). Shoeps fulfils Wippermann’s wishes about the study of history and its ultimate goal. If it is vital to know one’s enemy and his sinister ways, it is equally crucial to know all those people who had fought against Nazism, in their own ways, admittedly often awkwardly even ambiguously, so that we can safely affirm that we have learnt from their successes or rather shortcomings and that now we know how to combat fascism. 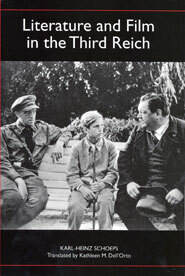 Schoeps’ Literature and Film in the Third Reich is an excellent reference book for the initiated and an excellent introduction for the beginners. More importantly, it is «a warning from history». "Inner Emigration" is not a clearly delimited concept. In an article that appeared in 1970 in the Weimarer Beiträge, Wolfgang Brekle, professor of literature, included in the Inner Emigration those writers who "were not influenced by the Nazi ideology, wrote humanistic works, and did not allow themselves to be gleichgeschaltet (forced into line) by fascist policies" (p. 228). Brekle thus limited the concept to non-fascist literature which he differentiated from anti-fascist/resistance literature. Felix Moeller. Der Filmminister: Goebbels und der Film im Dritten Reich. Berlin: Henschel, 1998. A tribute to the 1997 BBC documentary film series, The Nazis: A Warning from History.